March 2019 – New technical flyer! Our multifunctional differential pressure transmitter DE90 can be used for the medium air and neutral gases. We have compiled a flyer with interesting facts and advantages for you. First information can be found in this document. Furthermore, we will present our new device at the ISH trade fair in Frankfurt! March 2019 - New technical flyer! Our universal measurement indicator EA15 and data logger monitors, documents and optimises your processes. With a dynamic filter monitoring you can reduce your operating costs. February 2019 - For connection up to MODBUS-compatible automation systems, the 2-channel transmitter DE43 is now available for EX zones 2 and 22. The unit is typically used for technical air-conditioning, ventilation and surface applications. Two process connections can be supplied (standard and with 90° angle rotation). Measurement ranges extend from 4 up to ± 16 mbar max. As an optional feature the unit can also be supplied with 2 digital inputs for connection up to proximity switches. Additional querying is thus possible for these signals via the RS485 interface and the MODBUS RTU protocol from the overriding control system. 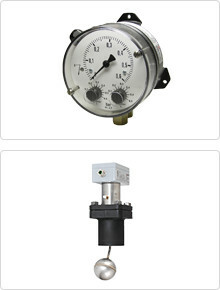 You will find further information on our homepage under the category Products/Differential Pressure. June 2018 - For our pressure hand-held gauge we have a summer special for you. The measuring instruments serve for field measurement of pressure, negative pressure and differential pressure in non-aggressive media. The MA25 is available in two executions in the following measuring ranges: 0-200 mbar and 0-2 bar. The gross price was reduced for you from 471,00 Euros to 229.00 Euros. The MA31 features seven measuring ranges and was reduced from 769.00 Euros to 349.00 Euros. Our offer is valid until the end of September. Application areas are versatile. The measuring instruments are for example applied for filter monitoring of air conditioners, service works at gas burners and in heating systems or for other inspection of industrial processes. Moreover, the devices are also frequently applied in the automotive sector. You will find further Details in our Flyer. Should you have any further questions, please do not hesitate to contact us. We are looking forward to your order. May 2018 - The differential pressure measuring device is applied in the field of chemistry, petrochemistry, process engineering and marine and offshore technology. Thanks to the welded construction any elastomer seals are not required. The diaphragm pressure gauge was completely revised and replaces the screwed execution. Class accuracy was considerably improved from 2.5 to 1.6 per cent. February 2018 - FISCHER now also offers various devices with the comprehensive metrological certification for the countries of the customs union (Russia, Kazakhstan, Belarus, Armenia, Kirghiz). For the certified devices, it is therefore confirmed, that the permitted measuring deviations for these devices are confirmed based on measuring-technical and calibration-law inspections. Successful completion of the examinations is followed by the entry in the state register and thereby approval of the devices that is mandatory in many areas. The maximum term application is 5 years. Metrological certificates must not be confused with EAC certificates that are now maintained under the term of "TR" (technical regulations) and comparable to the CE marking. These certificates apply to the customs union as well. DA01, DA03, DA08, DA09, DA10, DA12, DE13, DE25, DE27, DE38, DE39, DE40, DE44 (with LCD report), DE45 and DE46 (each with LCD and LED display). February 2017 - For room pressure monitoring (e.g. in clean rooms) FISCHER additionally offers differential pressure transmitters DE23 and DE46 with a measuring range from -20...+80 Pa. In the past, measuring ranges have been unidirectional, designed for overpressure or negative pressure or larger measuring ranges with lower resolution (for example 0...+100 Pa respectively -100...+100 Pa). The bidirectional measuring range enables safe detection of flow reversal. The measuring range in overpressure enables application in all clean room classes with several pressure levels and the relatively small basic pressure range provides high measuring accuracy. All sensors of the model range DE23 and DE46 are characterized by long-time stability as well as a very good reproducibility of measuring results. May 2016 - Our FISCHER-devices are implemented also for safety relevant applications. On our homepage you will find, from now on, the available certificates. Our measuring instruments can be used as flow and level guard and as flow controller, -limiter. The DS21 Differential Pressure Measuring and Switching Device is implemented as flow guard in heat transfer oil systems in compliance with DIN 4754-2:2015-03 and hot water systems according to VdTÜV Information sheet “Flow 100“. A further example for the DS21 is the application as flow limiter according to DIN EN 12952-11:2007-09 and DIN EN 12953-9:2007-09 in water tube boilers and system components (steam boiler plants). The NK10 Level Controlller will is used as level guard in heat transfer oil systems in compliance with DIN 4754-3:2015-3. December 2015 - 2 channel differential pressure switch / transmitter with LCD color change display is as of this date available for both channels with root extracted characteristic curve, thus meeting the requirements of a multifunctional unit. Two switch contacts, one display as well as various analog outputs are already integrated as an option. The second root extracted characteristic curve serves to record volume flows at different measuring points with simultaneously differently dimensioned measuring ranges , such as supply air, exhaust air or combined for both measuring points. The unit is therefore interesting for applications in the field of energy management as the different features contained in one instrument help to reduce assembly and installation costs. Flyer DE44 LCD. November 2015 - This new software supports transmitters with the firmware version 2.30. This is the direct link to the installer package: TransPara_V.1.063.